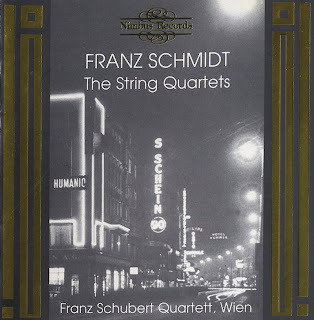 "Franz Schmidt was born in the Austrian city of Pressburg (now Bratislava) and began his musical training there. Subsequently, in Vienna, he studied cello with Franz Hellmesberger and piano with Theodor Leschetizky. At the Vienna Conservatory, his composition teachers were Robert Fuchs and Anton Bruckner. 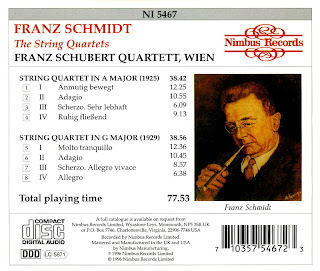 Schmidt served as a cellist in the Vienna Court Opera Orchestra (1896-1911) and played under Mahler. From the First World War until his retirement, he held many important teaching posts, eventurally serving as the director of theVienna Staatsakademie as well as Hochschule für Musik. Thank you for this rare piece of music! Many thanks for this music. Kan ik ergens een gebruiksaanwijzing vinden als ik een eigen weblog zou willen maken? I realize that you've probably abandoned this blog, but any chance of a re-up for this? Thanks!